And not just because of the flamers that you can outfit them with. But, let’s be honest, mostly because of the flamers you can outfit them with. It’s Cawdor time folks, so strap in. The Internet continues its terrible, unceasing labor. More photographs of little plastic soldiers–well gangers in this case–make their way from its darkened corners to your very eyeballs. And Tim Berners-Lee cackles deep within his fortress on the Netscape, only accessible via forgotten pathways that all but the most skillful of Navigators can use, secure in the knowledge that his creation has at last achieved its terrible purpose. Which is of course bringing 40K leaks, teasers, and spoilers to you. So let’s all tip our hats to Berners-Lee and the gamers who have fought the good fight and brought us the one thing we all crave. This week it’s leaked pictures of the sprues out of the Cawdor Box, along with a whole passel of rumors–which grain of salt aside, do seem like the sorts of things we’ve come to expect from Necromunda. So yeah, these are “I heard from someone that…”s but they’re at least well-fabricated ones, should they prove false. Say what you will about the Cawdor–that they’re crazy Redemptionists who are too extreme to be formally associated with the Redemptionists, that they love killing mutants but are also probably employing some under those creepy masks, that they should all be part birb–whatever you might say, you can’t argue that they look great. Look at the, shall we say, homemade quality of each of these weapons. All the hooks and spikes and torturous implements included on each of them, so that any member of House Cawdor can interrogate a heretic at a moment’s notice. Of particular note, the hook on the back of that bolter, with another hook also strapped to it. 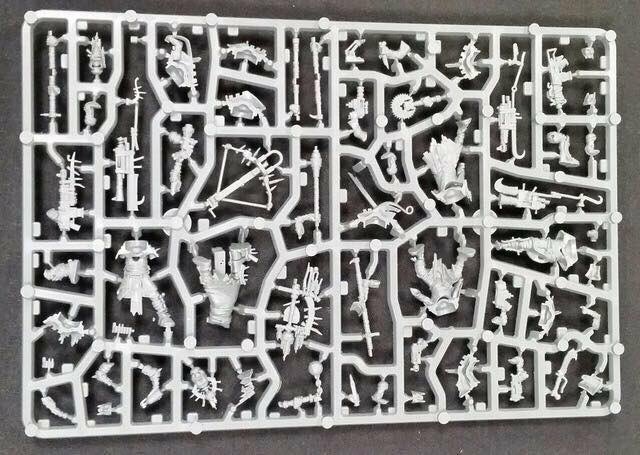 Enough Sprue ogling though, on to the rumors. But house also collects trash – to find relic – religious nuts. Recycles, orders, etc. 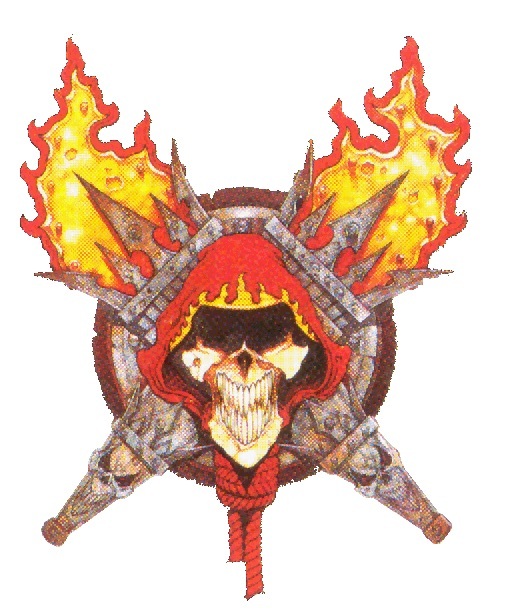 Not to be confused with redemptionists – Cawdor acceptable face of Red Redemption – official religion of Necromunda, to some degree. To some degree everyone pays lip service to the religion on-world. Cawdor take it really serioeus. But some take it too serous and they get outcasted, becoming redemptionists, wearing long red robes and goin around with flamers. If you are functioning house making stuff, i.e. Cawdor, you don’t want them – so redepmtionists are the outcasts from Cawdor (and maybe other houses). When first created, differentiated – done the opposite from combining, with Redemptionists coming down the line. Cawdor largest house – is this reflected in gang size – yes to an extent, partly expressed in weapons – some reclaimed autoguns, not quite as good as brand new polished autogun bought off orlock autotrader. Fair to say they get a few more numbers, rubbish weapons. One of main things, storytime, one thing really proud. On p. 10, orlock polearm weapons with autogun and blunderbuss – tom’s idea – this very much demonstrates all the rules for gang before model, write as models made to bounce off – somewhere in reliquaries of house Cawdor is an old faded book or shattered fragment of stained glass with barely discerned image of a custodes – and some Cawdor housemember saw this thinking it the epitome of all holy, and this image repeated, and they tried to copy. This is the weapon of the distant vengeful god’s angels – in this religion where all damend – celebrate this by venerating their weapons. So the gang is venerating things which they’ve only bearly heard about or seen in repeated images. Gang models are male – imitating the custodes. BUT in background, so girls will emulate sisters of battle – so there are female cawdor gangers. And again, the house is based on images and ideas of things they have never seen – so not direct translations – combined with rubbish/relics-recycling. Major point of design process not to give them ork-esque weapons, to make them look like ‘cawdor’ weapons not ‘ork’ weapons. How fit in with other hive – all gangs fighting proxy wars of clan houses – all this territory – manufactories with millions on mullions of industrial helots who if lucky get to sleep under their work stations, generations whose job is stamp out widgets, but further down hive get fringes of society – lawlessness, anarchy – great for clan houses who get to fight war. Clan houses reliant on one another, existing in profit , but still like to kill each other – purpose of gangs. But for Cawdor, the person who is in charge – Thane of Cawdor (har har har – yes deliberate) – when pass on, they name successor who could be anyone, from second in command to a juve or a horrible joke, and put pet rat in charge. So any gang leader could be next Thane of Cawdor – so various leaders, fighting wars for the Thane, punishing the sinners (esp Goliath and really especially Delaque), could be named next Thane. (all the candles help – very Wolf Hall!) So Thane views himself as guardian of Necromunda, and say who is saved. So punish unbelievers, take offence. One person suggests ‘Dog-dore’ as a gang leader name…. Bionics – the cawdor have crude ones. Remind us they are in scifi setting. Their limbs – cast offs. All have masks – hardened leather, as don’t want to expose face to others – not worthy of uncovering faces as E might see. Bindings around weapons – weapons are relics to them according to their faith. But weapons are reclaimed, so rubbish to us and others. But to the Cawdor (eg Sully) his autogun is holy. But Sully is damned and dirty. So the bindings protect the weapon from being touched by him. Baldrick with crossbow – panzerfaust launched by crossbow – antitank. Tom came up with idea. ‘what’s medieval’ – crossbow – but too medieval. So had to fire explosive bolt cause that’s just funny. Two firing modes. ‘Just fun, which is the main reason to do weaponry.’ And then get a suspensor…..
Names – people noticed Cawdor is Macbeth and Scottish medieval name – what kind of naming conventions we give gangs. There is always one – an internal logic. So example names – Beluk, Caban, Hoyk, Hawbert, Cowl, Daggett, Cotus, Gambusson, Barbett, Snood, Antipope (sic) – there is a naming convention here. And pronunciation guide will be useful! It is item of clothing – but these are medieval items of clothing. [I need to spell them right – but check out Tudor Tailor for fun!] In other languages – when he worked in studio – in far east, O’Shaua[?] means commander Noodle Leg. Skills – leader – brawn, leadership and ferocity (sec) and savant (sec). Champion – brawn, agility (Sec); juve – ferociety (pr), agility and combat (Sec); specialists – feoricty, agility (sec). Leaders too old for agility. Close in fight gang – come across in pole-arm weapons – versatile weapons. polearm blunderbuss – main – way to get interesting variation into weapon effects into one weapon – cawdor scavenge all sorts of stuff, speerating it into orderly piles over hours, blessing it, and giving lots of different shots – grapeshot (s2 d1 6+ ammo, temp) negation (temp, s3, blaze – didnt want to go all in on fire in – thats for redemptionists), emperor’s wroth (8-12 range, s4, pulverise). Plus pole arm for close combat. The dwarf and big guy – not mutants – still two legs, two arms, etc – no tentacles. Cawdor House Brute – Grunt and Snivels, The Candlekin, House Cawdor. These are Stigmata creatures. Others will be in the book apparently. What is on p. 5 – cawtlescrattor from hanged gang; archetypal cawdor ganger, on cover too. Idea – every gang has house list, saying a lot about who they are. Other things from trading post. his escher gang bought last night a webber for leader, to put down goliaths, and also has two phyrr cats which activate at same time, then go and eat the laying goliath. His tactic. Jessica, a part of his turfwar with an escher gang, writes in having joined twitch specificaly and she says she wont let that webber anywhere near her. And her rating is far higher. Dice. Colour wise this is ‘swirly copper colour with tasteful teal’, ‘shimmy iridescent effect’. Let it burn. At start of round, for duration, all ranged friendly weapons gain blaze trait. Setting people on fire, running in all directions – much fun. Dead men walking – ignore bottle test. In general, can’t go wrong with cards that give extra activations – in this deck it is Duck and Cover – all gangs – a fighter may make two fire basic actions with pistol weapons, then move d3 inches. Snap Fire – ready fighter may make action at fhigther just shot them with pistol or basic. Divine motivation – duration of battle, soemthing with cool checks. Themed around House Cawdor – even the broader ones. who struggle against most? no central weakspot – gangs on a spectrum – goliath one end, big tough, little bit shooty, van saar at other end – cawdor in middle, escher in CC range but not as tough. Delaque ? Orlock shooty but tough and all-rounders. But Cawdor not got great range (only the heavy stubber really and perhaps long rifle). Cawdor House character done – handed off to production – but can say no more. Kria for Escher – agents for house, as with Slade – out soon.